ACL injuries are relatively common in dogs. This article will discuss what the problem is and how we fix it. In dogs, this joint is sometimes called the stifle. The end of the thigh bone, or femur, rests precariously on the top of the tibia, or lower leg bone. The ends of each bone are covered with a thin layer of cartilage called articular cartilage. There is a cartilage pad called the meniscus in between to cushion the bone ends. The whole thing is held together by ligaments. There are two cruciate ligaments. They are named “cruciate” because they cross each other. They are located inside the joint in between the femur and the tibia, and together they keep the femur sitting squarely on top of the tibia. 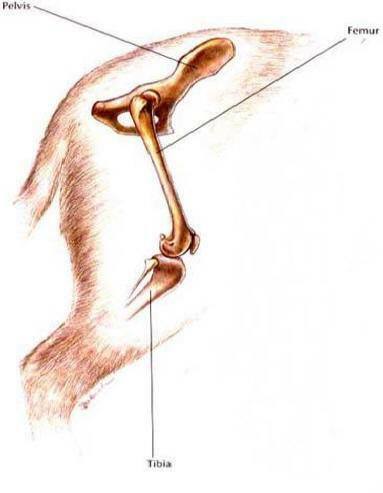 One of the cruciate ligaments is located more to the front, and is called the anterior cruciate ligament (ACL) in human medicine and the cranial cruciate ligament (CCL) in veterinary medicine. We’re going to stick with ACL in this article because that’s how most people know the ligament, even though technically it is the CCL. What happens when one of the cruciate ligaments breaks? If one of the cruciate ligaments were to break, the femur and the tibia would be able to slide back and forth freely on each other, and this is exactly what happens. Because of some peculiarities in the anatomy, it is almost always the ACL that breaks and not the caudal cruciate ligament. 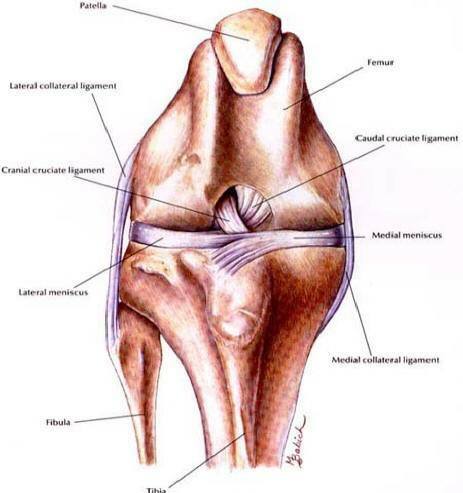 When the ACL ruptures, the joint becomes unstable and painful. If not treated, severe, debilitating arthritis will develop. The first reason is for a healthy ACL to be severely traumatized. The trauma can be a mis-step, a fall, a twist, or a sudden wrench. This would be the kind of injury that happens to football players. We see this type of acute injury most commonly in young, athletic dogs, and it typically happens while they are exercising. The other way an ACL can fail is by slow degeneration. In some middle-aged, somewhat overweight, less active dogs, the ACL will begin to degenerate slowly over years. Eventually the ACL fails entirely, and failure may occur during something as non-stressful as a walk around the block or getting up. Often, these knees will have developed advanced arthritis before the ACL ever fails. These dogs often rupture the ACL in the other leg within a few years as well. In my practice, the slow, degenerative ACL injuries outnumber the acute traumatic ACL injuries. It is thought that poor knee conformation is the root cause of most ACL ruptures, especially of the slow degenerative ones. If an x-ray of the knee is taken, it can be seen that there is an angle formed between the top of the tibia and the shaft of the tibia. 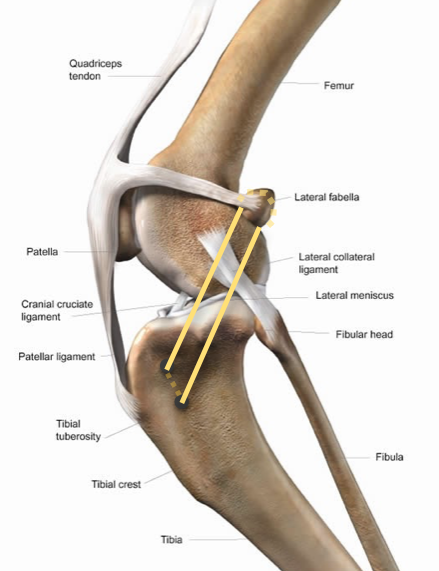 This angle is called the Tibial Plateau Angle. In the image it is 25 degrees, a nice, normal number. This angle is important because in theory, if it is too high, there will be excessive strain on the ACL and that will lead to instability and ACL rupture. While there is a lot of support for this theory, in reality the issue is not that cut-and-dried. 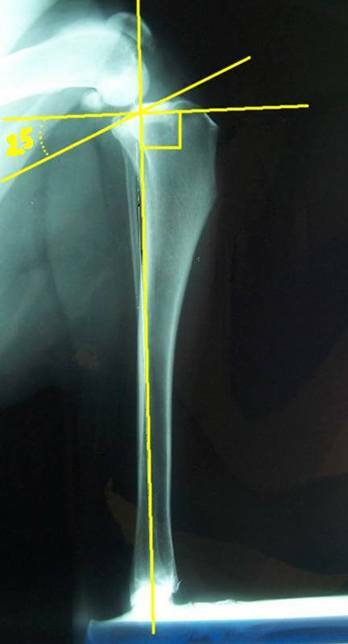 Many dogs with ACL ruptures have normal Tibial Plateau Angles. In fact, the data show that in general, dogs with ACL ruptures really don't have significantly steeper Tibial Plateau Angles than dogs without ACL ruptures. Most veterinarians do agree, however, that dogs with ACL ruptures with steep Tibial Plateau Angles pose some special problems that we will cover later. There have been several procedures developed that changes the slope of the tibial plateau. 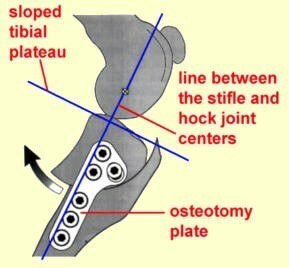 The most common of these procedures, the Tibial Platuau-Leveling Osteotomy, or TPLO, involves cutting the tibial in two, rotating the plateau, and plating it back together. The ACL itself is not actually repaired, in this procedure. The new tibial plateau angle is what stabilizes the joint. The surgeons who pioneered this technique, in a highly controversial move, actually patented the procedure, and then made a fortune selling equipment and running training schools. Although the patent has now expired, because of the technical nature of the procedure and the expensive instrumentation required, it still is mainly done by Board Certified specialist surgeons. It has the advantage of a fairly rapid recovery and in general good results, especially in larger or more active patients, but has the disadvantage of being more invasive and more costly to perform. Most referral surgeons charge somewhere in the neighborhood of $3,000 to $4,000 to perform a TPLO, and this does not include a couple of trips to the referral center, so you can budget another $250 plus your time to that. 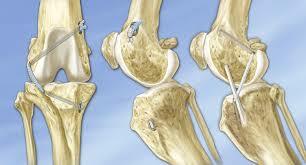 The second way to treat ruptured ACL's is to implant an artificial ligament. The artificial ligament technique is much older than the TPLO, although it has undergone many refinements over the years to make it work even better. 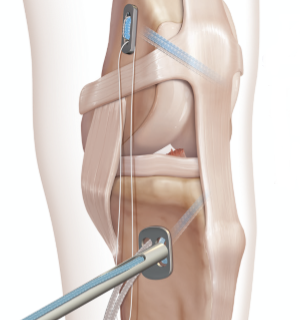 The older artificial ligament techniques involved placing various materials, usually stiff nylon fishing line or similar materials in various ways, fastened by knots or crimp clamps. In the 80’s we used to use actual 80 lb test fishing line! The nylon was anchored through soft tissues on the femoral end and bone tunnels placed in an easily-accessible site on the tibial end. While better than nothing, there are many problems with this kind of repair. The nylon often fatigued, stretched, and broke quite rapidly. Also, the placement of the implant was such that it did not closely mimic the function of the original ACL. As the joint flexed and extended, the tension on these implants would change, resulting in abnormal joint function, more meniscal tears, and earlier implant breakage. Tightening these suboptimally-placed implants enough to stabilize the joint often resulted in a decrease the range of motion of the joint. Moreover, the soft tissue attachment on the tibial end was weak and somewhat sloppy, and the implant often migrated in time. The bone tunnels on the femoral end were not placed in the optimal location, resulting in mechanical problems. The most recent refinement of the technique is called the Tightrope Procedure, named after the hardware that is used. Utilizing materials used for repairing ankle and shoulder injuries in humans, this procedure uses an ultra-strong 21st-century braided material made by Arthrex, a multi-national supplier of human medical implants, to replace the torn ACL. The Tightrope implant is anchored firmly through holes drilled in the bones themselves. There is none of the fatigue, stretch, or breakage that was so common with the older techniques. Instead of the old soft tissue attachment on the femoral end, the Tightrope is anchored directly to the bone, and so there is no sloppiness, and the implant does not migrate over time. The bone tunnels in the tibial end are placed in a much more mechanically-favorable place, so that there is no change in tension as the joint flexes and extends. This results in a very natural replacement of ACL function. There is no loss of range of motion. You will recall that the meniscus is a cartilage cushion that fits in between the ends of the femur and the tibia. When the ACL ruptures and the joint becomes unstable, the meniscus becomes vulnerable to the shear forces of the two bones moving in abnormal ways. Again, anatomical peculiarities make it so that it is always the medial side of the meniscus that tears in dogs. The joint is surgically opened, and the medial meniscus is examined. 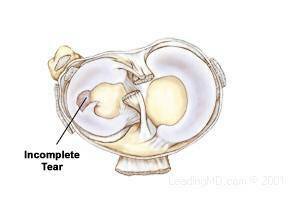 If a tear is found, the torn part must be removed, as the meniscus does not heal by itself. If the tear is severe, all or part of the entire medial meniscus must be removed. Meniscal tears can significantly impact the success rate of the procedure. 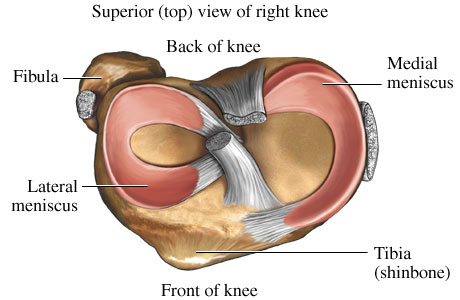 A meniscal tear, even if the tear is removed, can result in a less-functional meniscus. This meniscal weakening alone can lead to arthritis and pain, even if the ACL repair was 100% successful. However, even though removing even part of the meniscus makes the remainder weaker, it is still better than leaving the tear. Meniscal tears can happen even months after a successful ACL surgery. Depending on the study, post-surgical meniscal tears have been estimated to occur in 5% to 20% of cases. My experience is that the 20% figure is quite high. In the cases I see, the rate seems to be a lot closer to 5%. If a meniscal tear happens after surgery, the only option is to re-open the joint and remove the torn part. In an effort to reduce the number of meniscal tears, a procedure called “meniscal release” was developed. In this procedure the medial meniscus is cut free from the tibia, or released, so it can travel to the back of the joint and in theory avoid tearing post-operatively. The problem is that the meniscus does not belong in the back of the joint, and when it is released and goes there, it does not function normally. The procedure is quite controversial, with some well-known surgeons doing it all the time, even on normal menisci, with some equally-well-known surgeons doing it occasionally under certain circumstances, and some more well-known surgeons never doing it under any circumstances to an otherwise healthy meniscus. While meniscal release was intended to prevent post-op meniscal tearing, there are some problems. For one, it does not totally prevent post-op tears. Most folks will agree that it decreases the chances, but if the incidence is only 5% to start with, does halving that to 2.5% make that much difference? Also, meniscal release has been shown to cause arthritis and lameness when done to normal knees. 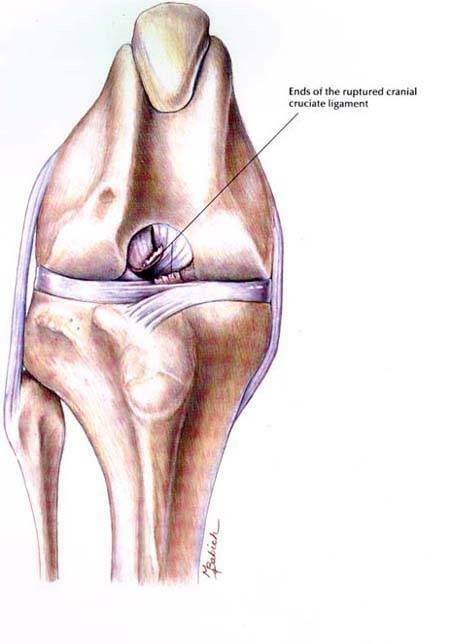 A study done by Luther et al in 2009 found that doing a meniscal release in a normal healthy knee resulted in arthritis and pain within 12 weeks even when there was an intact healthy ACL. Given that meniscal release provides a benefit to a small percentage of cases and causes arthritis all by itself in patients that receive the procedure, I decided that I am in the latter camp. I may release the meniscus if there is a pre-existing tear, since the function of the meniscus is already compromised, but not if the meniscus is healthy. So which technique is better? When the TPLO was first introduced, it was claimed that the TPLO technique was better in all situations. However, as our experience with TPLO increases, the research studies show that TPLO and Tightrope do not differ that much, and patients can having either technique can experience excellent results. Click here for some studies. Although there are lots of opinions out there, my opinion is that the jury is still out on this one. Both techniques, the TPLO and the Tightrope, can be used on most dogs with excellent results. However, there are some situations most surgeons would agree on a few things. For starters, all surgeons agree that any form of surgery is better than no surgery at all. Dogs that are operated on, regardless of which procedure is done, do much better than dogs that don’t get surgery. Dogs that don't get surgery develop severe arthritis over the subsequent months and years, and ususally have a significant limp and decreased quality of life. Both TPLO and Tightrope, and for that matter even the older artificial ligament procedures will prove to be a real blessing to a dog with an ACL tear. So if budget concerns are keeping you away from opting for TPLO, the Tightrope procedure will be much better than no surgery at all. Very large dogs (75 pounds and up). The bigger the dog, the less likely they are to do great with the Tightrope. This is not to say that big dogs can’t do well with the Tightrope. They can. My record is a 115-pound Great Pyranees. TPLO was not an option financially for the owners, so we did a Tightrope, and that patient did very well. But the odds of a less-than-ideal outcome become higher the bigger the patient. Very active dogs. Rest is very important is a successful recovery from the Tighrope surgery, and dogs that are difficult to keep quiet might not do as well. Not that you can just turn a TPLO patient loose right after surgery, but rest is more important for the Tightrope patients. High Performance Dogs. If your dog functions at a level where you would be able to notice the difference between 90% of normal and 95% of normal, TPLO may be better. Dogs that have steep tibial plateau angles do better with the TPLO. Most dogs have plateau angles around 25 degrees. Once they start approaching 30 degrees the chances of success with the Tightrope start decreasing. Dogs with a lot of internal rotation do better with the Tightrope, since TPLO does not control internal rotation. Dogs with pre-existing arthritis do well with the Tightrope, because the arthritis eliminates any advantage TPLO might have. With the TPLO, because the tibia bone is actually sawn in half and plated back together, if something happens to the plate there will be big problems. Things like implant infection, screw failure, or plate failure can lead to limb-threatening complications. You could end up with a bone that can not be re-plated. Because the ACL is never actually replaced, the TPLO has a somewhat higher incidence of meniscus problems post-op. With the Tightrope, the main complications are implant loosening and implant infection. The Tightrope is more prone to implant infection that the TPLO is. However, the worst thing that can happen with the Tightrope is that if things do not work out well, the implant can be removed and you are back where you started. Then, a TPLO, another Tightrope, or any other procedure can then be performed. So which procedure do I choose? A little better choice for older dogs or dogs with pre-existing arthritis or other problems. Payment plans can often be worked out. Dogs with ACL ruptures do much better with any surgery than without surgery. With either technique, most dogs (95% or so) return to normal or near normal function. After any ACL surgery, it is not uncommon for dogs to not recover to 100% of where they were before the injury. Dogs with acute ACL tears do best, while those dogs with chronic ACL degeneration and tears often have significant arthritis at the time of surgery which never goes away. The research studies have failed to show any significant differences, on the whole, between techniques. Both techniques have complications at about the same rate, but the TPLO complications can be more severe. The TPLO costs about twice what the Tightrope costs, more if you include the trip or trips to the referral Surgical Center. Call Sunnyside Vet Clinic today to discuss the options for your dog's injured ACL.